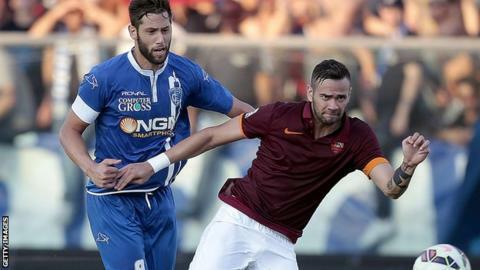 Roma defender Leandro Castan will undergo brain surgery next month. The Brazilian suffered acute dizziness after September's league game with Empoli, his only appearance this season. Roma confirmed the 28-year-old has a cavernoma, clusters of abnormal blood vessels in the brain, but say it "does not represent a threat to his life". "He is currently in peak physical condition [but] he is at risk of reoccurrences," said a club statement. "Therefore, the medical staff, club and player have agreed that he will undergo neurosurgery at the beginning of December in order to definitively cure the problem. This will allow him to resume regular competitive sporting activity." Roma boss Rudi Garcia said: "We're all with Leo. After the operation he'll be back with us. He's a champion and a warrior. We'll wait for him."